St. Louis has experienced minor earthquake damage at least 12 times in the past 200 years. Because of this history and its proximity to known active earthquake zones, the St. Louis Area Earthquake Hazards Mapping Project will produce digital maps that show variability of earthquake hazards in the St. Louis area. The maps will be available free via the internet. They can be customized by the user to show specific areas of interest, such as neighborhoods or transportation routes. Earthquakes currently (2010) cannot be predicted, but scientists can estimate how strongly the ground is likely to shake as the result of an earthquake. Earthquake hazard maps provide one way of conveying such estimates. The U.S. Geological Survey, which produces earthquake hazard maps for the Nation, is working with local partners to develop detailed maps for urban areas vulnerable to strong ground shaking. 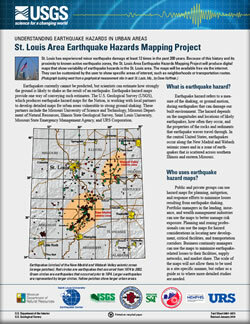 Williams, R.A., 2010, St. Louis earthquake hazards mapping project: U.S. Geological Survey Fact Sheet 2007-3073, revised January 2010, 2 p.